Synopsis: Low pressure east of the Mid-Atlantic will slowly lift toward southern New England through tonight. High pressure will build over the southeastern United States through Tuesday. A cold front will approach from the Ohio Valley Tuesday night, stall just south of the region Wednesday, then return north as a warm front Thursday as low pressure tracks from the Ohio Valley toward the northeastern United States. A cold front will follow for Friday. Small Craft Advisories may be needed for portions of the waters Tuesday night into Wednesday, and again on Friday. Variable winds less than 5 kt becoming S around 6 kt in the afternoon. Sunny. Seas 1 ft or less. 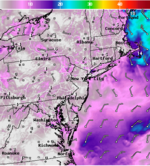 S wind 8 to 10 kt becoming SW after midnight. Partly cloudy. Seas around 1 ft.
WNW wind around 8 kt. A slight chance of showers after 2pm. Seas around 1 ft. Variable winds less than 5 kt becoming NNW around 6 kt in the evening. A slight chance of showers before 8pm. Seas 1 ft or less. SSE wind around 6 kt. Showers likely. Seas around 1 ft.
SW wind 7 to 9 kt becoming W in the afternoon. Showers likely. Seas around 1 ft.
NW wind 7 to 11 kt. Partly cloudy. Seas around 1 ft.